Chancellor Alistair Darling has warned Britain faces a background of "economic uncertainty not seen for generations". Delivering his Pre-Budget Report in the Commons, he said he wanted to take "fair and responsible steps" to protect and support businesses and families while putting public finances on the right path for the future. Mr Darling told MPs the measures he is taking will ensure the "slowdown will be shallower and shorter" than would otherwise have been the case. He is due to announce a 2.5 per cent cut in VAT to 15 per cent - to be paid for in part by increasing income tax on the wealthy after the downturn has concluded. It is part of a £15-£20 billion "fiscal stimulus" to encourage spending and spur economic growth. And the Chancellor is expected to announce a 45 per cent rate of income tax for those earning at least £150,000 a year. But the new tax band will not be introduced until after the next General Election, which must be called by May 2010 at the latest. It is thought to be among a series of deferred tax increases designed to bring down borrowing incurred now to fight the recession. 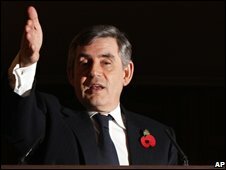 Earlier, Prime Minister Gordon Brown promised to use tax cuts to inject new vigour into the British economy and reduce the length and depth of the recession. Speaking to the CBI conference in London, Mr Brown rejected the Conservative argument that tax cuts now will simply store up a "tax bombshell" for the future. The failure of Conservative administrations to act early during recessions in the 1980s and early 1990s meant that the downturns lasted longer, causing more economic pain in the long term, he said. The Prime Minister said letting the recession run its course is not an option and that the Government must offer "help when help is needed, not when it is too late". And in a direct attack on David Cameron's approach he warned: "To fail to act now would not only be a failure of economic policy, but a failure of leadership." Mr Brown rejected the orthodoxy of recent decades which states that monetary policy on interest rates should be the Government's principle macro-economic tool. Insisting that "extraordinary times require extraordinary action", he said that fiscal policy on taxes must also be used to prevent a deep and lengthy recession. By protecting the British economy now, the Government can actually prevent higher tax and interest rate increases in the future, he argued. Speaking after Mr Brown, Tory leader David Cameron told the CBI that "monetary activism" - lower interest rates - should be the Government's main tool to support the economy. Mr Cameron noted that the Bank of England's Monetary Policy Committee considered a 2 per cent cut in the base rate earlier this month, but scaled it back to 1.5 per cent because of an expectation of a fiscal stimulus in the Pre-Budget Report. "We have consistently argued that Government must not do anything to make further interest rate cuts less likely. The CBI and the Conservative Party are agreed that monetary activism - lower interest rates and getting credit flowing again - is our top priority. "As your director general said last week, getting the credit markets working properly is much more important than the fiscal boost." He accused Mr Brown of "misrepresenting" his position as one of inaction. "This is not walking on by," he insisted. "This is offering sensible, practical and costed help for businesses and families through this difficult time. "Mr Cameron proposed a new Government institution to guarantee new loans, which he said would allow banks to expand lending at a time when they are wary of risk. "I believe that simply cutting interest rates and then appealing to the banks to pass them on is not going to be enough," he said. "As well as lowering interest rates, monetary action should mean radical new measures to actually get credit flowing through to businesses." Lloyds TSB are being sued for in excess of 100 million pounds for in damages, for not proceeding with a secured business property loan of 506,500 pounds that Lloyds TSB promised in writing to lend secured against a property with a sworn valuation of 830,000 pounds and a strong asset backed tenant Yahoo Real Estate Limited paying 104,000 per annum with a balance sheet of around 100 million pounds. The INL News Group are proposing to include orders in their legal actions for an injunction to be placed on the proposed Lloyds TBS takeover of HBOS until the full determination of the INL News Group's legal action and for orders for the court to order the removal of the Lloyds TSB banking license in the United Kingdom. The statement of claim to be filed in court as part of the legal action against Lloyds TSB will include claims that are backed up by proven facts, that the management of LLoyds TSB are not operating the bank under fair and proper banking rules and for that reason should have their banking license removed and further and in the alternative should not be allowed to take over another bank until they can prove to the court and the community, that they are going to act as responsible bankers in the interests of the community as a whole in providing loans to the business community and the wider community on a fair and equitable basis after receiving billions of pounds from the taxpayers of the United Kingdom to lend to the business community to stimulate the economy to bring the county out of recession. The fact that Lloyds TSB have reneged on a well secured and cash flow backed business $506,500 loan that was approved in writing a few days prior to the proposed settlement causing the borrowers and others the borrower represents over 100 million pounds in damages, shows that LLoyds TSB and its current directors and management are not acting as fair and reasonable bankers and are not in the least interested in lending money to the business community to stimulate the British economy to and help create employment. Instead they would prefer to use the cash funds available for gambling on the international currency markets and the stock exchange by placing cash at their disposal in other currencies to make instant profits with the falling British Pound, and in fact by doing do contributing to the falling of the British Pound. SIR Sean Connery yesterday backed campaigners trying to halt the takeover of HBOS by Lloyds TSB. The 007 star sent a message of support to the Merger Action Group, whose legal challenge to the deal will be heard in London today. Connery told the group: "I never saw anything that got bigger get better." MAG spokesman Malcolm Fraser said: "Sir Sean's message adds to that groundswell of opinion that the Government is not above the law and should not have pushed through this merger without reference to the proper legal framework." The campaigners will challenge Labour's decision to waive competition rules to allow the takeover, saying it is bad for shareholders and customers. Former Bank of Scotland chief Sir Peter Burt urged shareholders to block the deal. The man behind Bank of Scotland's merger with Halifax to create HBOS claimed that original deal had "turned out to be a disaster". He said: "If the HBOS board had more spine than a jellyfish, they could have done a better job for shareholders." HBOS want the deal to go ahead, saying it is in their best interests. Last night, campaigners accused Business Secretary Peter Mandelson of "bully-boy tactics" after he threatened to seek legal costs from them over the case. Meanwhile, rival HSBC boosted the mortgagemarket, revealing they plan to increase lending by a fifth. They will lend up to £15billion in mortgages in 2009 - almost double the 2007 level. 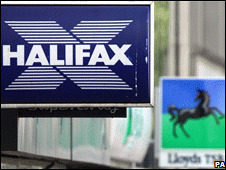 A legal challenge to the takeover of Halifax Bank of Scotland (HBOS) by Lloyds TSB has started in London. The Competition Appeal Tribunal is considering whether the government was right to bypass competition concerns in allowing HBOS to be rescued. The case has been brought by an organisation calling itself the Merger Action Group (MAG). HBOS is confident the ruling, due on Tuesday, will approve the deal, ahead of the final shareholder vote. "It is time that people stopped using HBOS as a plaything," said HBOS spokesman Shane O'Riordain. "We're confident the appeal will be unsuccessful and we would then ask this self-appointed group to withdraw." MAG is a group of businessmen, bank customers and shareholders who feel that allowing Lloyds TSB to buy HBOS will be bad for Scotland's economy . They say that Business Secretary Lord Mandelson's decision to allow the deal to go ahead was based on new legislation that had not been in place at the time it was announced. The legal process has been fast-tracked to ensure there will be a ruling before the HBOS shareholders vote on the deal on 12 December. Although the tribunal is being held in London, it is being heard under Scottish law. Prime Minster Gordon Brown has dismissed calls for Lloyds TSB's takeover of Halifax Bank of Scotland (HBOS) to be scrapped. It was the only "serious" bidder, he said, despite reports the Bank of China was in early talks on a rival offer. His comments came after an attempted takeover by two former bank chief executives was rejected by HBOS. Meanwhile Scottish financier, Jim Spowart, said nationalising HBOS would be preferable to Lloyds TSB takeover. Mr Brown told his regular Downing Street press conference that there had been no announcement by any other financial institution that it was prepared to take on HBOS. "The problem is that apart from Lloyds TSB no serious bid that is funded has actually come forward," the prime minister said. "It is not going to change much if one person says he wants to, or they want to, take over a bank if they have got no money behind them. And that is the issue we face at the moment," he said. eparately, Jim Spowart, who has been acting on behalf of another, unidentified, possible bidder for HBOS, said the option of nationalisation should be examined. He also called for other potential offers to be looked at. BBC business editor Robert Peston reported on Monday that Bank of China hoped to make a bid for HBOS. However, he said that if Mr Spowart and Bank of China were anywhere near to making a formal offer, "they would by now have been forced to make a statement to that effect by the Takeover Panel". Mr Spowart - who set up the Intelligent Finance online bank, a division of HBOS - would not confirm that Bank of China was the bidder. The debate over the future of the Lloyds-HBOS deal intensified after Sir Peter Burt, formerly of the Bank of Scotland, and Sir George Mathewson, ex-head of the Royal Bank of Scotland, said they should be appointed to lead HBOS. They said they would take over temporarily as chairman and chief executive, come up with a plan to keep the bank independent and end the proposed £12bn Lloyds TSB takeover. But HBOS's board said their plan offered no value to its shareholders. Despite this, Sir Peter and Sir George say they still intend to call an extraordinary general meeting for HBOS shareholders to find out their views. They say HBOS no longer needs to be rescued by Lloyds TSB, because the government and Bank of England have offered vital funds. First Minister Alex Salmond said of Sir Peter and Sir George: "They are the two outstanding figures in the Scottish financial sector over the last generation, and therefore their views command great respect." The Merger Action Group tonight [Wed] said it was disappointed to lose its legal challenge against the Government's decision to ignore competition law to push through the Lloyds TSB's proposed takeover of HBOS. But the group was heartened that the Competition Appeal Tribunal [CAT] found they were right and proper people to bring the action which had been raised under public interest concerns. Immediately after the tribunal ruling, MAG said it was considering its position over whether it would appeal the tribunal's decision to the Court of Session in Edinburgh. MAG spokesman Malcolm Fraser, an Edinburgh architect, said: 'We are pleased that Sir Gerald Barling QC, the tribunal chairman, acknowledged in his findings that we were absolutely right to bring this case forward in the public interest, despite the best efforts of Lord Mandelson's legal team to have our case rejected. "We will now be having intensive meetings with our legal team regarding a possible appeal to the findings of the tribunal. 'This whole process has been run on a truncated timetable and we have complied with that. 'However, we owe it to all those who have offered their support to ensure that we explore every available avenue in making sure the merits of our case are fully explored. We will advise the court of a decision in due course. 'We have said from the start that, on behalf of many ordinary and concerned shareholders, account holders and employees, we felt we had to contest the decision to "rip up" competition rules in order to facilitate a takeover over which growing numbers of people – ordinary members of the public, bank customers, shareholders, businesses and politicians from across the divide – have serious concerns and doubts. We are all glad to have made the stand we did, and will continue to stand up for what we believe in. 'It remains our belief, shared by many, that allowing this proposed merger to go forward without due and proper consideration by the Competition Commission, sets a dangerous precedent. 'We did not embark lightly on this task. It has been onerous and at times highly-charged, ranged as we were against the combined might of the Department of Business, Enterprise and Regulatory Reform (BERR), HBOS and Lloyds TSB. During the two-day hearing, the tribunal heard that MAG had won the backing of some 630 members of the public, while First Minister Alex Salmond and Mr Peter Vicary-Smith, chief executive of Which? – Europe's largest independent consumer body with more than 700,000 members - were among others who had written to the tribunal in support of the appeal. Although the hearing was held in London, it was conducted under Scots Law because the applicants were mainly Scotland-based and the impact of the merger if it goes ahead will be felt more keenly north of the Border than elsewhere. He said they shared the concerns of the Office of Fair Trading [OFT] which, in a report before Lord Mandelson's made his decision, warned that the merger could lead to a significant lessening of competition. The OFT said the takeover should be referred to the Competition Commission for further investigation. However, Lord Mandelson disregarded this advice after both Mr Brown and Mr Darling had earlier spoken publicly in favour of the merger. Mr Forrester said the proposed merger should have been open to public scrutiny, but that 'the Government had a clear policy' that the deal should go ahead. Legal Challenge to HBOS merger decision. A group of businessmen, customers, account holders and shareholders are mounting a legal challenge against the UK Government’s controversial move to allow the merger of HBOS and Lloyds TSB without referring it to the Competition Commission. The Merger Action Group [MAG] has lodged an application with the Competition Appeal Tribunal [CAT] claiming the decision by Business, Enterprise and Regulatory Reform Secretary Lord Mandelson was ‘unlawful’. Download the full press release here: Legal Challenge. The Brussels-based members of our legal team with the appeal documents. These documents have now been lodged with the Competition Appeal Tribunal in London, which commenced Monday 8th December. A cross-party group of MSPs have offered their full support to MAG’s legal challenge and campaign. They met MAG spokesman Malcolm Fraser at Holyrood. L to R are:- Alex Neil, SNP, Margo MacDonald, Independent, Malcolm Fraser and Tavish Scott, leader of the Scottish Liberal Democrats. The Merger Action Group has been formed to challenge the decisions made by the UK Government in promoting the merger between HBOS and LLoyds TSB whilst disregarding any alternative, and waiving the normal process of competition. We believe these decisions to be unlawful and against the interests of fostering employment, competition and the taxpayer's best interest. MAG has asked the Competition Appeals Tribunal to overturn the decision of the Secretary of State, Lord Mandelson to not refer the Merger to the Competition Commission, a decision which was against the recommendation of the Office of Fair Trading. Please support our campaign, to ensure the Competition Commission can fully address the impact on the UK Economy of the significant competition issues identified by the OFT. In addition we want the UK Government to consider alternatives that would not cause such competition issues and be better for stake holders including shareholders, employees, customers and tax payers. The Merger Action Group said today [Thurs] it felt it had done all it practically could to highlight the widespread public concern over the Government's decision to waive competition law to push through the takeover of HBOS by Lloyds TSB. Accordingly, MAG has decided to conclude its legal challenge and will not be appealing to the Court of Session following the Competition Appeal Tribunal's ruling. For the full press release on the CAT decision, please click here. Business Secretary Lord Mandelson 'short-circuited' the law to push through the Lloyds TSB takeover of HBOS under pressure from the Prime Minister and Chancellor who had already decided it must go ahead, the tribunal heard today [Tues]. For the full press release on the second day of the CAT, please click here. Neither the Prime Minister, the Chancellor nor the Business and Enterprise Secretary had the power to waive competition law when they allowed the proposed merger of Lloyds TSB and HBOS to proceed, a court heard today. For the full press release on the first day of the CAT, please click here. The legal challenge to the UK Government's decision to approve the HBOS-Lloyds TSB merger without referring it to the Competition Commission is to begin on Monday [Dec 8th]. For the press release in full, please click here. Regulatory Reform Secretary Lord Mandelson was ‘unlawful’. appeal with CAT, which has the power to overturn the Government’s decision. Scottish and both Lloyds TSB and HBOS are registered Scottish companies. unease about what has taken place. that the law is properly applied, and that our long-term interests are protected. in European and competition law, to lead the appeal. Competitions Commission and their decision is legally binding. should have been referred to the Competition Commission. emerged that HBOS was in advanced merger talks with Lloyds TSB. the public interest benefits of creating financial stability. his decision on October 31.
himself that were not available at the time the merger was announced. not take place HBOS would collapse and destroy stability in the financial system. OFT, and therefore his decision was made on a false assumption. served as it should be. to haunt us in the future. Employees of HBOS will hold a demonstration outside the bank’s Extraordinary General Meeting (EGM) in Birmingham on Friday 12th December. Unite members will wear t-shirts with slogans saying: “SECURE JOBS = SECURE BANK” in a bid to remind shareholders that the voice of employees must not be ignored. Unite the union represents staff at both LTSB and HBOS. Staff will hand out mock ballot papers to shareholders as they enter the meeting calling on them to use their vote for a secure bank – “Don’t forget the workers at LTSB and HBOS.” The leaflets to shareholders form part of the campaign to make the voice of employees heard. Unite members will demonstrate to show that they are committed to the organisation and will continue to work hard to protect the future of the bank. The current climate of speculation about the future of the bank has resulted in a great deal of uncertainty and insecurity for Unite members. Unite recently launched a 'Social Contract ' which sets out the union's expectations for the future of the financial services sector. For more information or for interviews please contact: Saba Mozakka, Unite Press Office on: 020 7420 8916 or 07768 693 953. The energy companies are full of heartless excuses on why they can't reduce our fuel bills. "There is nothing more important than keeping a roof over our families' heads and Gordon Brown has shown that he understands this and is prepared to act." Derek Simpson, Unite's joint general secretary has today spoken out in support of Michael Martin, speaker of the House of Commons and accuses the Tories of a witchhunt based on snobbery. HBOS shareholders are meeting in Birmingham to vote on the bank's rescue takeover by Lloyds TSB and an £11.5 billion taxpayer bail-out. Approval will clear the way for the creation of a banking giant with around 145,000 staff and 3,000 branches across the UK. Unions fearing tens of thousands of job losses as a result of the deal are planning protests outside the meeting at the NEC centre. Unite's joint general secretary Derek Simpson said: "It is vital that HBOS shareholders do not merely consider the financial rewards of a takeover, but the wider social and employment implications. Along with the loyal customers, employees of Lloyds TSB and HBOS are the life-blood of these banks." But HBOS chairman Dennis Stevenson has warned the bank could face full nationalisation if shareholders fail to approve the takeover. The Government is already set to own as much as 43.5% of the combined entity - to be known as Lloyds Banking Group - after underwriting a total of £13 billion in new shares offered by the duo to strengthen their balance sheets rocked by recent financial turmoil. These new shares are likely to be snubbed by existing investors because the offer price is above the current share prices of the duo. Current HBOS investors - which include two million smaller shareholders - will be left with a stake of just 20% in the combined bank, with Lloyds TSB shareholders owning 36.5%. Competition concerns over the HBOS takeover have been put aside in the interests of financial stability.